Why Do People Use Burdock? The oral preparations of Arctium lappa (Burdock Root Powder), like burdock tea, are utilized as blood purifier (diuretic), antipyretic and antimicrobial. In addition, burdock root powder is used for gastrointestinal (GI) complaints, to treat anorexia nervosa, gout, rheumatism, syphilitic disorders, cystitis and chronic skin conditions including psoriasis and acne issues. Some secondary purposes of burdock tea are the treatment of hepatitis, arteriosclerosis, to treat hypertension, to cure cancers, for inflammatory conditions, catarrh, treating colds and as an aphrodisiac. 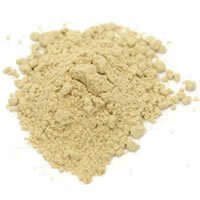 Topically burdock root powder, it is also utilized for acne, dry skin (ichthyosis), eczema and for psoriasis as well. In food items, burdock root is utilized as an important ingredient. Possibly Safe - Burdock root powder is possibly safe when utilized in food items. However, there is lack of authentic information to determine the safety of burdock when used for the preparation of different medicines. Possibly Unsafe in Lactation and Pregnancy - Regarding safety of burdock when used in lactation and pregnancy, there is insufficient reliable information available. So, females in such conditions should avoid its use. Regarding effectiveness of Arctium Lappa, there is insufficient reliable information available. Most effective parts of burdock are its leaves, seeds and roots. Its root extract seems to have antitussive activity and might enhance immunological activity. Initial research recommends that it may have free radical scavenging and anti-inflammatory activity. Root extract of burdock may also prevent from liver toxicity caused by carbon tetrachloride and ethanol likely because of its antioxidant activity. Clinical experiments also have confirmed that constituents obtained from the seeds of burdock may decrease the level of platelet activating factor. Arctiin, a chemical present in the seeds of burdock, has the capability to prevent from cancer. Other clinical experiments also recommend that arctiin may be transformed into antiestrogenic and estrogenic compounds by the activity of bacteria present in the gut. Regarding its hormonal activity, in vitro of analysis of Arctium Lappa and its constituents, mainly arctiin, has not produced fruitful results yet. Leaf of burdock may have effects like anticandidal and antibacterial effects. What Are The Side Effects /Adverse Reactions of Burdock? The oral consumption of burdock root powder may results in side effects like allergic reactions, especially in those individuals who are sensitive to Compositae / Asteraceae family of plants. In rare cases anaphylaxis has been reported following the intake of Arctium lappa preparations. Family members of Compositae / Asteraceae family include chrysanthemums, ragweed, daisies, marigolds and many other herbs as well. According to some clinical experiments, burdock tea may cause anticholinergic symptoms, such as dizziness, dry mouth, weakness, blurred vision, dilated pupils and also inability to urinate. Topically, contact dermatitis issues may occur by taking burdock powder without any caution. How Burdock Interacts With Other Herbs and Supplements? Antiplatelet / Anticoagulant Supplements and Herbs - Since it has antiplatelet activity of its own, the concomitant use of burdock powder and antiplatelet herbs and supplements may substantially increase the risk of bleeding. Herbs with reported antiplatelet activity include clove, Panax ginseng, angelica, garlic, danshen, ginkgo, ginger and other herbs. How Burdock Interacts With Drugs? Antiplatelet / Anticoagulant Drugs - Interaction rating of antiplatelet / anticoagulant drugs and burdock powder is moderate so be careful of this mixture. Theoretically, bleeding risk could increase because of a decline in platelet aggregation following concomitant intake of Arctium lappa and antiplatelet and anticoagulant drugs. Burdock may decreases the platelet level in blood by preventing platelet activating factor. Antiplatelet and anticoagulant drugs include clopidogrel, warfarin (Coumadin), aspirin, dalteparin (Fragmin), ticlopidine (Ticlid), heparin, enoxaparin (Lovenox) and some other drugs. How Burdock Interacts With Foods? How Burdock Interacts With Lab Tests? How Burdock Interacts With Diseases and Conditions? Cross-Allergenicity - Side effects like allergy is reported in those individuals those who are sensitive to Compositae / Asteraceae family of plants. Members of Compositae / Asteraceae family of plants include daisies, ragweed, marigolds, chrysanthemums and other herbs. Surgery - Burdock powder possesses antiplatelet effects and increases bleeding risks in some patients. But this bleeding could be serious if Arctium lappa is preoperatively utilized. So, such patients who wish to undergo some surgical procedure should be advised to stop using burdock powder at least two weeks prior their recommended surgical procedures. What Should Be the Dose/Administration of Burdock? Not typical dosage for burdock powder or burdock extract. If burdock gets adulterated with herbs like deadly nightshade and belladonna, it may cause serious atropine poisoning. Anticholinergic or atropine poisoning symptoms include dizziness, dry mouth, weakness, blurred vision, dilated pupils and also inability to urinate.